RUDSET Institute in Kannur provides FREE Training in Photoshop for the people of Kasaragod, Kannur, Wayanad, Mahe aged between 18 to 45. 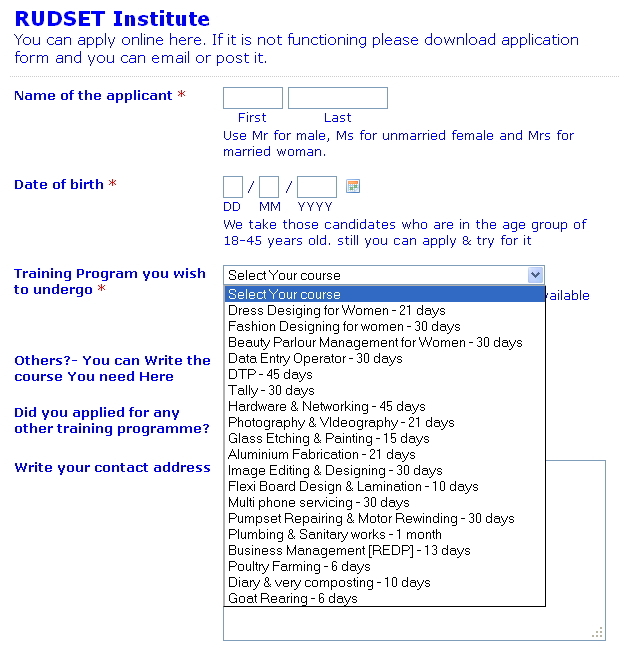 Interest person can apply online at rudseti.webs.com or download application, fill it and send to the address below. Eligibility: Any Unemployed People can Apply. Interested people can visit the website rudseti.webs.com and download the application form and fill the details like Name, Parents Name, Age, Address, Phone Number, Previous Experience in Computer field etc and send the application form to the address below. There are various other FREE Trainings are provided for eligible candidates. Course Title and Duration of the Course will be available in the Online Application Form. Select from the drop down box while applying online. Interested candidate can Apply through Online also by clicking on Apply Online in the Website. For more details please call 91 4602 226573 or +91 4602 227869.